Tame Valley Wetlands is excited to share with you the first of a few short videos filmed underwater in our fabulous rivers. We have been working with Jack Perks who has perfected the art of underwater filming and we are truly thrilled with the results. Our first clip was filmed on 25th September 2018 at three points within the River Tame at Kingsbury where we carried out river restoration work in 2014. The River Tame was once dead to life. 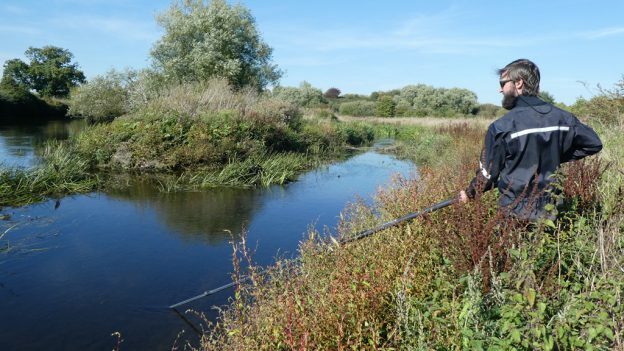 Decades of work to improve water quality and improve river habitat are helping the river recover to its former glory, with grayling being caught by anglers in recent years. The film shows different age classes of fish and certainly points to a productive fishery, supporting natural recruitment. The short film is both fascinating to watch the behaviour of fish but also is very relaxing. Dive in and watch the video. Look out for the pike! This entry was posted in Featured, Latest News and tagged fish, river tame on 27th September 2018 by Sarah.